We have a progressive range of bachelor’s, master’s and doctoral level programs that address the changing needs of the nursing profession. Learn more about the Clinical Simulation Institute, where our students practice their skills prior to actual clinical experience. Our faculty members are actively engaged in evidence-based research. Learn about research projects in progress. Get to know our dedicated, experienced faculty members. 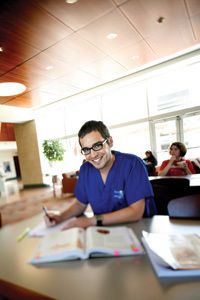 Find out what it takes to become a part of our faculty ranks. Become a member of the Tau Iota Chapter of Sigma Theta Tau. Membership is by invitation and eligibility is based on the candidate's academic and professional achievement.